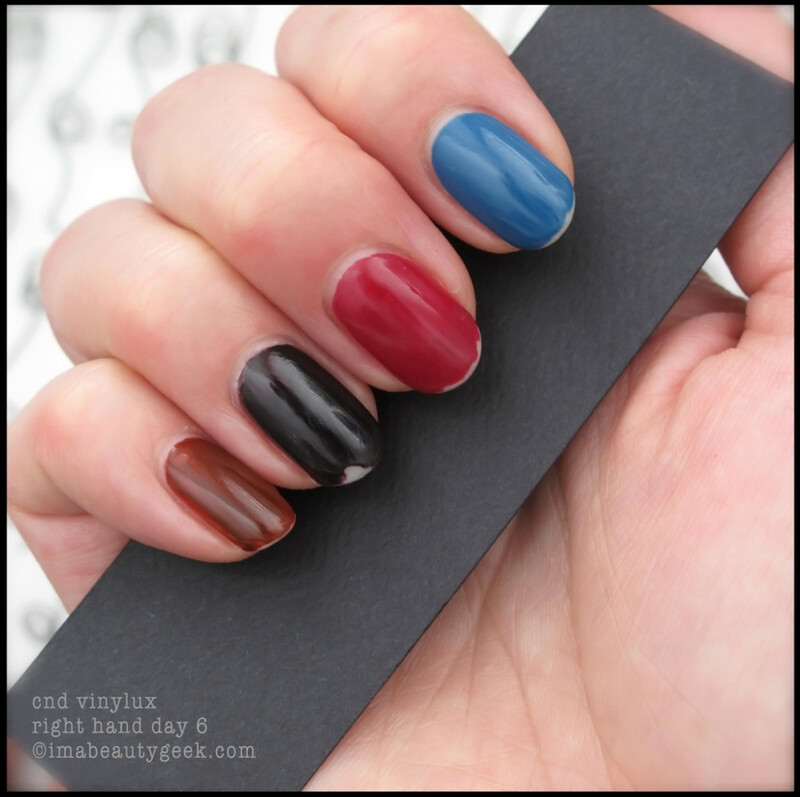 CND Vinylux Review: 7 Days + 2 Testers = Does CND Vinylux Really Last? 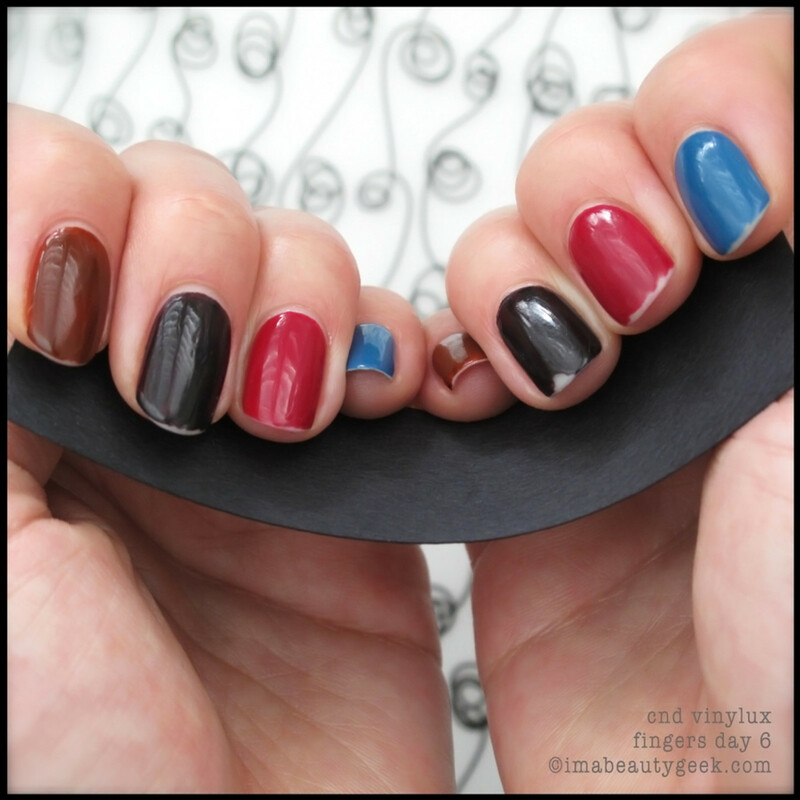 Now that I’ve shown you all the lovely Spring 2014 CND Vinylux Open Road shades you’ll be able to get your hands on this January, let’s talk about how this weekly polish wears. So far, feedback has been mixed, from raves to pans. 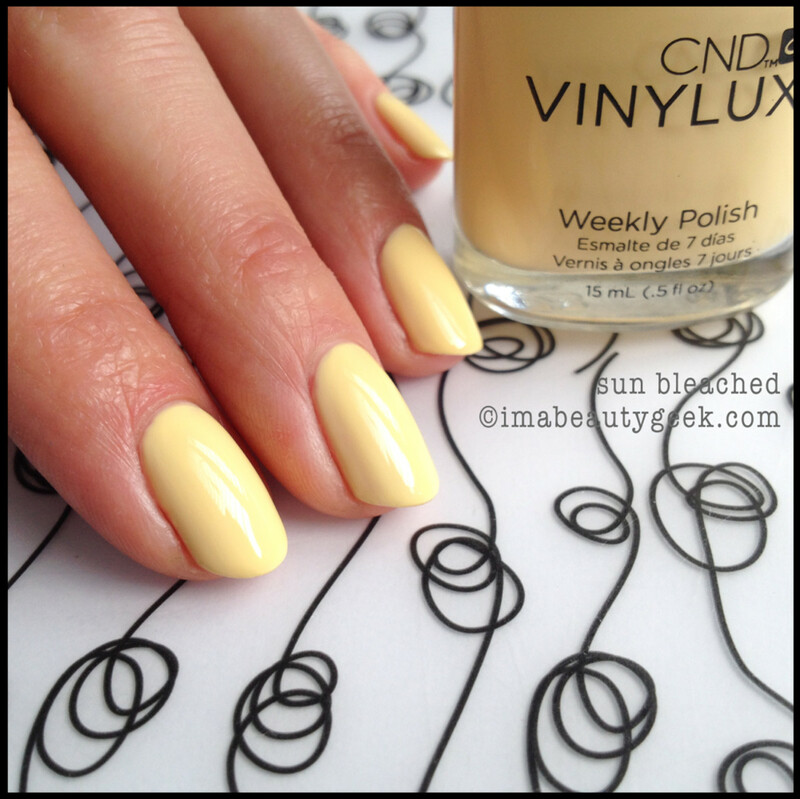 Here&apos;s our CND Vinylux review. 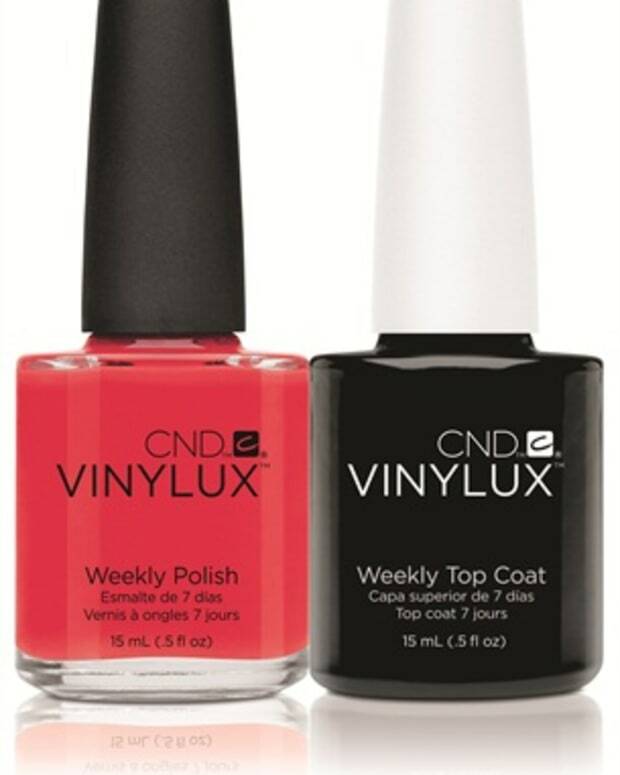 If you’re not familiar with the CND Vinylux Weekly Polish System, we’re talking about a nail polish combined with a weekly top coat wherein “more than 80% of clients had no chipping after 7 days” of wear. I am not one of the 80%. 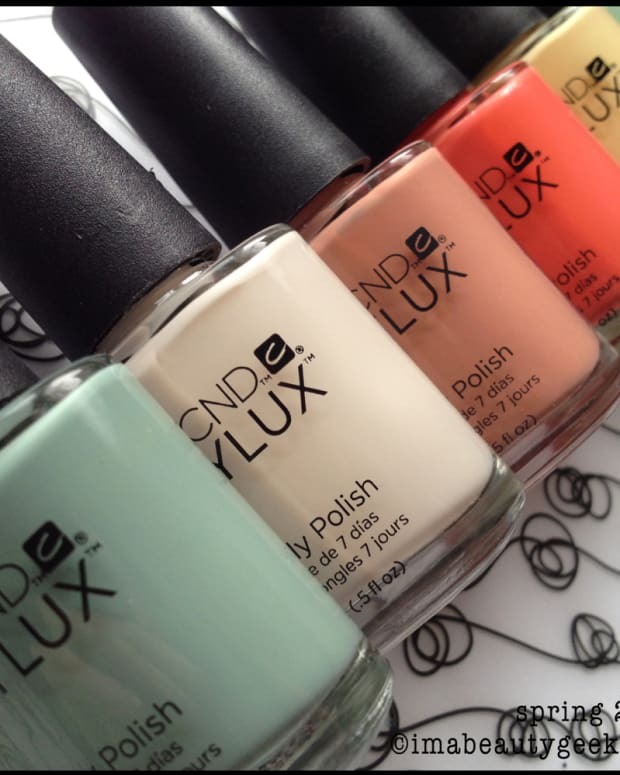 For you, curious reader, I tested the entire CND Vinylux Forbidden Mini Collection – all six shades of it. 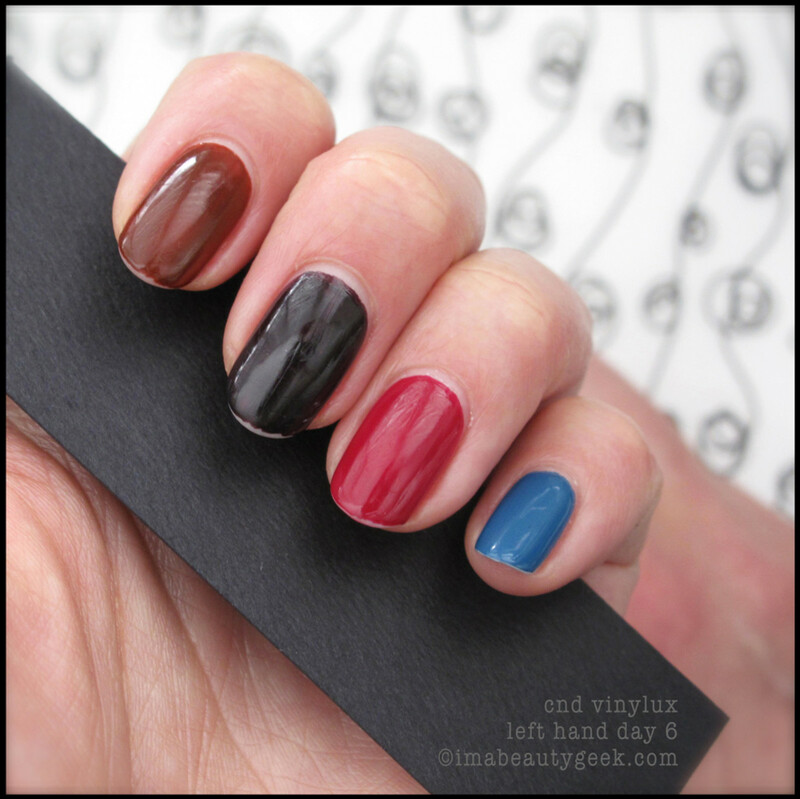 Yep, for this CND Vinylux review, I wore different colours on different fingers to see which colour wore best on what hand and what finger. You’re thinking “Wow, you went outside in public with that manicure?” No, I was home with the flu so I had a good six days of nothing to do except change the channel on the TV and make myself soup. I didn’t really use my hands for much at all. 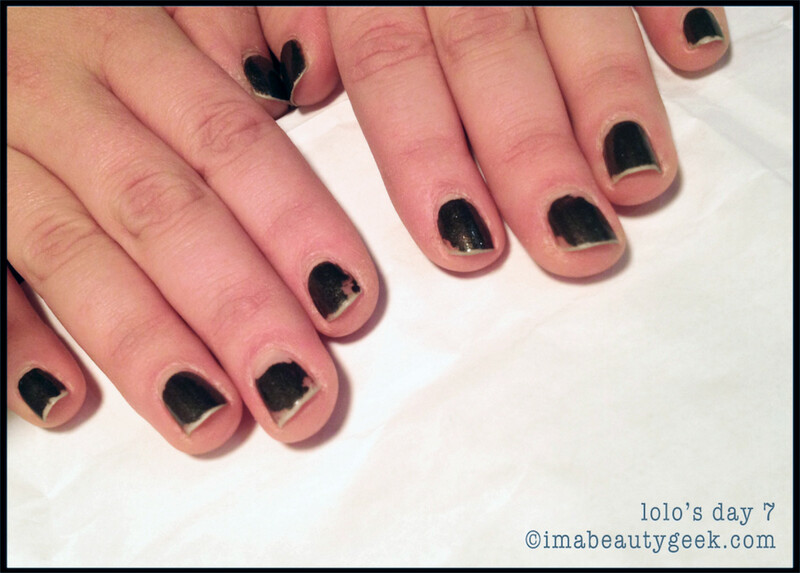 This is the kind of wear I typically see of a regular polish after one 8-hour shift at work, so to have this kind of wear after 6 days (really only 5 x 24 hour periods of time with the photos taken on the 6th day), is pretty remarkable -- until I factor in that I did nothing except sleep and watch TV. The wear at the free edge (you know I capped it properly) happened within the first day and just kept getting progressively worse. The shine dulled within two days, and the chipping started to happen after about 3 days. I’m right handed and as you can see, there is a little more wear on the polish on my right hand compared to my left. The polish on my thumbs weathered the six days the best, and that’s more than likely due to that micro-glitter component. I was in fact so pleased with the wear on my left thumb that I took the bottles to work and painted a co-worker’s nails myself to see how well it wore in real life as opposed to influenza-life on the couch. 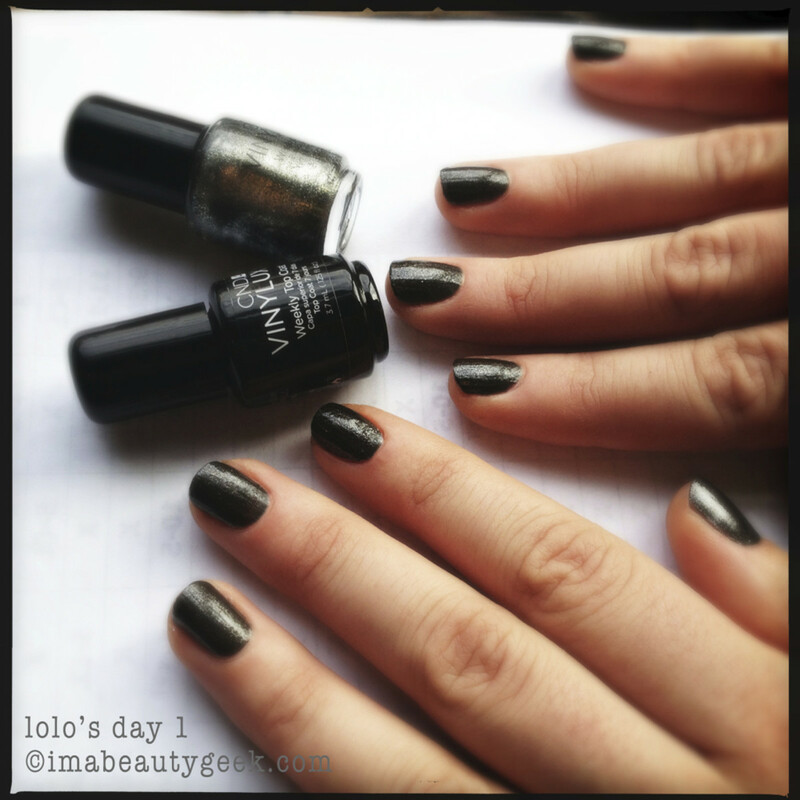 For part two of this CND Vinylux review, please enjoy the 7 full days of wear that Lauren (aka LoLo) got from CND Vinylux Night Glimmer. She started chipping on day 2 and it just kept getting worse from there. I don’t quite know how she could stand to wear it for the full week, but that LoLo is a real trooper. Big props to her for having the strength of character to weather this particular polish test. 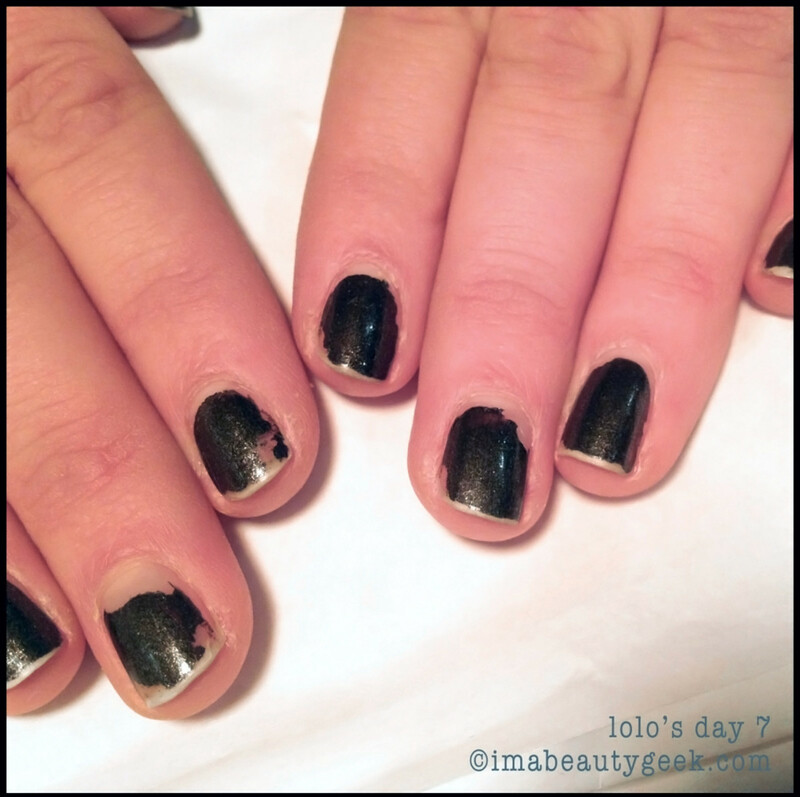 I have since given another bottle to another co-worker and she achieved similar results to LoLo’s with tiny chips within 24 hours and enough wear within 3 days that it had to be removed. So, how do I really feel about this “weekly” polish. Ha! I think you know. But, I quite like the polish as a regular polish. 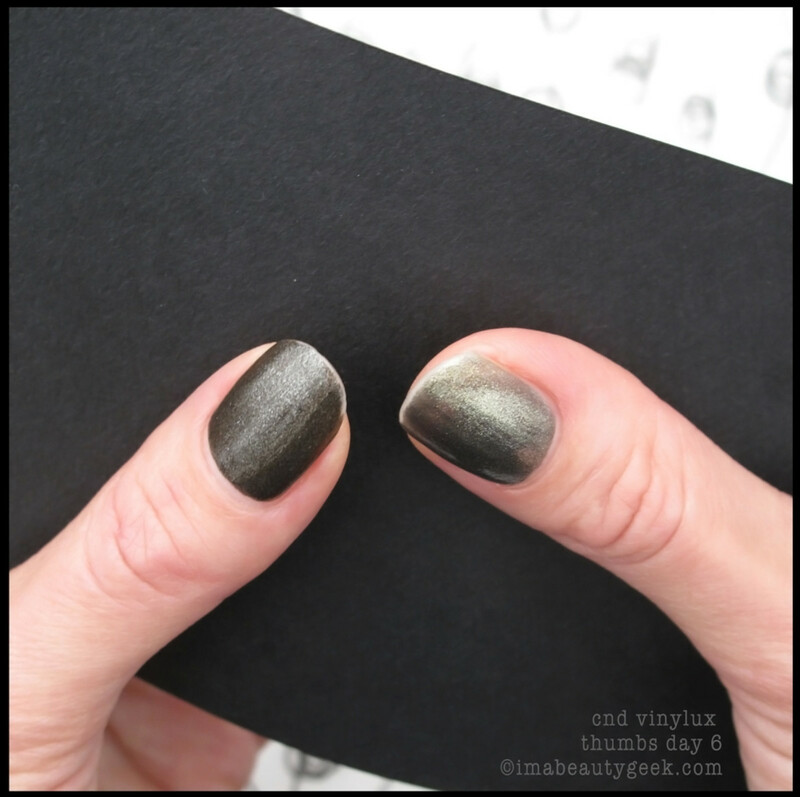 I really do like the Spring 2014 Vinylux Open Road shades (I’m 100% gonna sport that Sun Bleached yellow -- above -- tomorrow, and that Mint Convertible green soon after), and although the polish isn’t long-wearing on me (or my co-workers), I’ll still wear it. I just know that for me, it’s only going to last 2 or 3 days maximum. 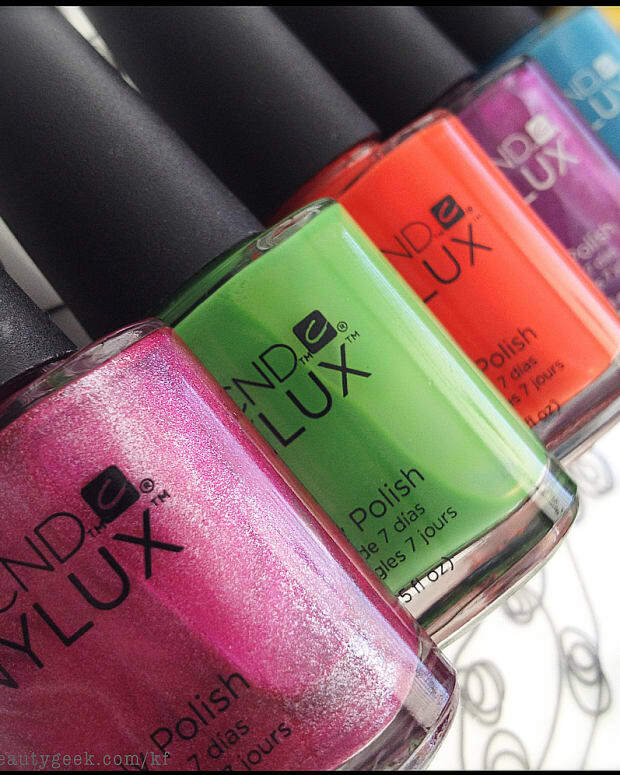 CND Vinylux 7pc The Forbidden Mini Collection ($42 at nailpolishcanada.com) and lots of other shades of CND Vinyulx polishes ($11.95 each at nailpolishcanada.com) are available now. 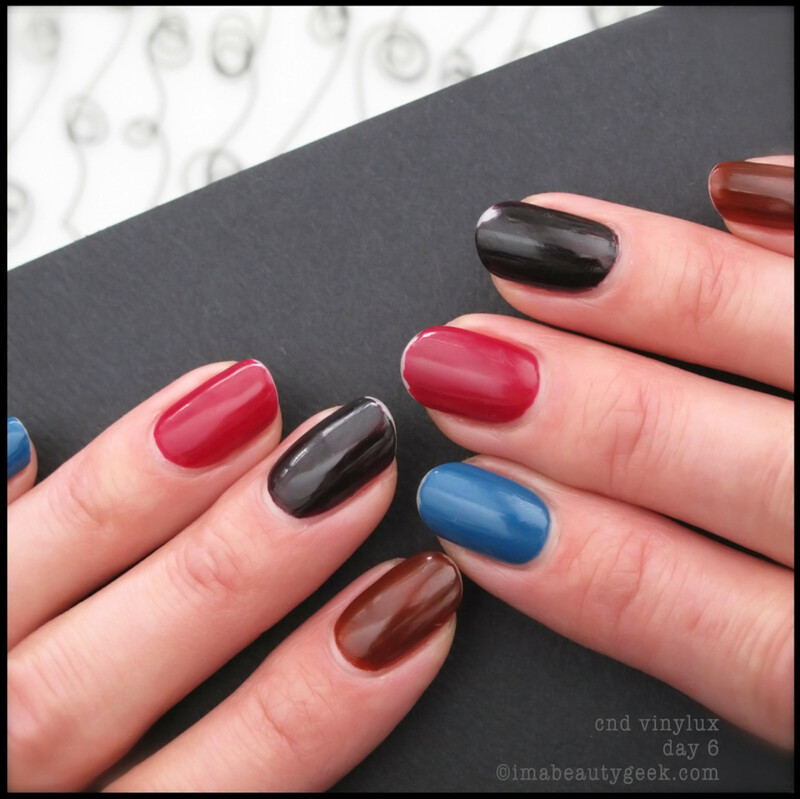 CND Vinylux Open Road shades ($11.95/15mL) will be available later this month. 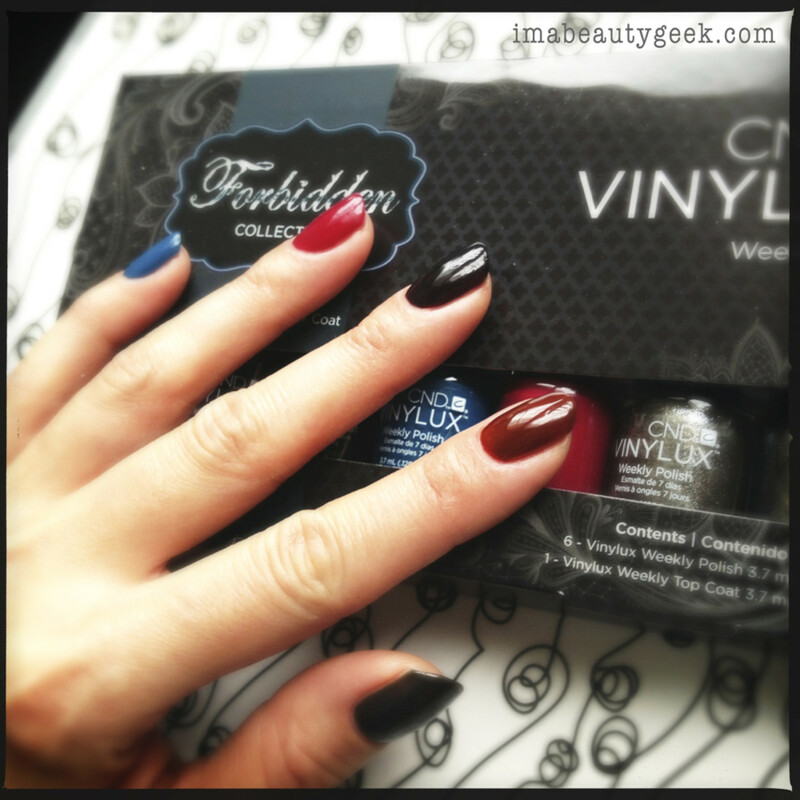 I&apos;ve rambled on long enough -- what&apos;s your experience with CND Vinylux Weekly Polish been? Did you come here to see if it’s worth investing in, or did you come to confirm that the wear you’ve had is common? I’m curious to know if anyone out there has had 7-day success with it. If you have, I’d love to know which shade in particular it was! Share, people! Share! I’m a curious mind and curious minds needa know!